Express Kitchens adds 'Mero" to their line of fine kitchen cabinets. For mission appeal, Mero is a timeless choice. Sharp white shaker style recessed center panel doors and drawer fronts will compliment any countertop of your choice. Warmth, charm, simple flat detail, exceptional quality, and superior value are expressed in our newest cabinet addition. Features include solid birch, full overlay doors and cabinet face frames. Drawer and door fronts have a 5-piece flat recessed MDF center panel with mortise and tenon joint construction. Face frame is 1-5/8” wide by 3/4” thick solid wood doweled and glued. Face frame is dadoed to receive the side panels. Box construction is 1/2” plywood sides with matching painted exterior and 1/4” back panel with hanging rails. Drawer box is 5/8” solid wood with dovetail construction and fully captured 1/2” plywood bottom. Cabinet interior features a natural birch wood veneer finish. Cabinets come with fully adjustable 3/4” plywood shelves for wall and base units with metal shelf clips. Six way adjustable heavy duty steel concealed hinges with integrated soft close and heavy duty steel undermount full extension drawer guides with soft close feature and Quick Clips come standard. Stop by your nearest Express Kitchens retail store soon to preview this very popular cabinet and see what their in-store designers can do to turn your kitchen into the kitchen of your dreams. For more information: (860) 247-1000 or http://www.expresskitchen.net. 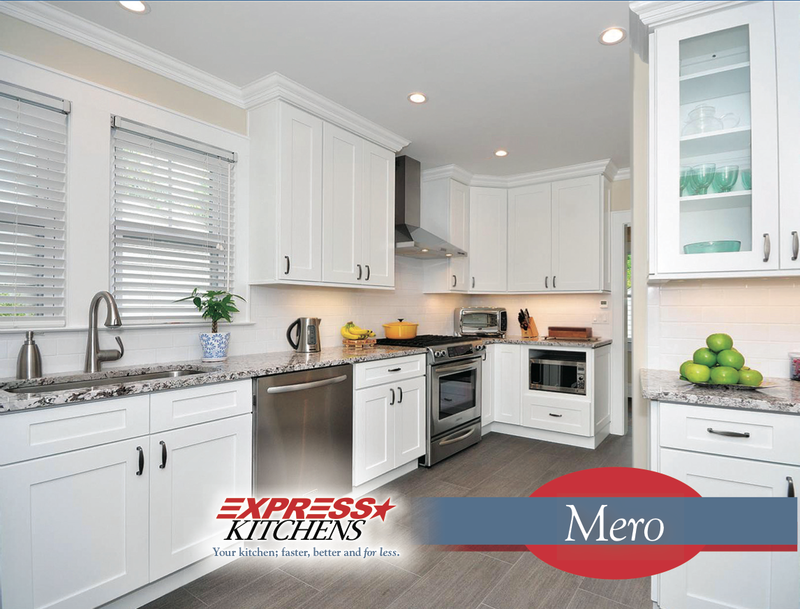 Express Kitchens adds 'Mero' to their line of fine kitchen cabinets.